If you are eating packaged salads from any of these brands, make sure you read the rest of this article. The CDC has recommended that all consumers and restaurants not eat or serve these brand salads packaged in the Springfield Ohio facility. 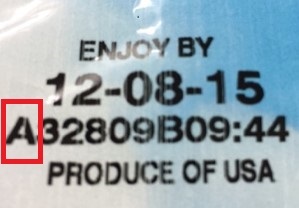 You can determine the processing facility by the letter A near the expiration date as shown in the image. These salads may have a Listeriosis bacteria outbreak as reported on January 22, 2016 by the CDC. For most people, this is not a problem. If you have salad in your house or facility, CDC says to follow these steps. 1. Throw the packaged salad away in a closed plastic bag placed in a sealed trash can. This will prevent people and animals from eating it. 3. Wash cutting boards, surfaces, and utensils used to serve or store packaged salads. If possible, use a dishwasher; otherwise, use hot water and soap, followed by sanitizing with a solution of one tablespoon chlorine bleach added to one gallon of hot water. 4. Wash your hands with warm water and soap after cleaning up. What to do if you have eaten salad from this facility? 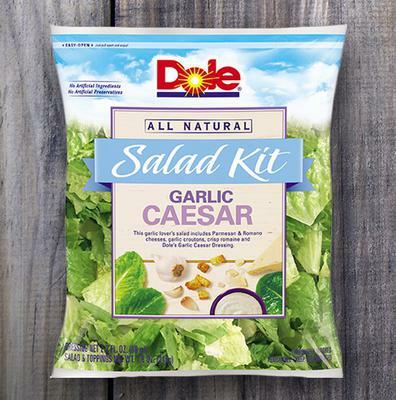 If you have eaten a Dole brand packaged salad and do not have any symptoms, most experts believe that tests or treatment are not needed, even for persons at higher risk for listeriosis. What the symptoms may look like? People who develop symptoms of listeriosis after eating possibly contaminated products can consider seeking medical care and telling a healthcare provider about eating that product. Although people can sometimes develop listeriosis up to 2 months after eating contaminated food, symptoms usually start within several days. CDC's Advice to consumers and restaurants.